If you’re newly married or engaged to be married, few things are more important than discussing your finances with your partner. Regardless of how you structure your accounts, communication is essential! Setting goals is one of the most important things that many couples fail to accomplish. Whether you’re growing financially or struggling to get by, having a budget and some financial goals are crucial to building your lives together. If you don’t know where to start, consider some of your short term goals. Maybe you want to pay off a credit card (or two!). Maybe it’s saving up for a new car or a down payment on a home. Whatever your goals may be, the best way to work toward them with your partner is for you both to be on the same page about your finances. You will likely have different habits and lifestyle tendencies than your partner. If haven’t lived together before now, getting used to this change can come as a shock to some. This can be even more complicated if one partner earns or spends significantly more than the other. By looking at the sum total of what each of you can afford to spend each month, you can approach a combined lifestyle that is agreeable to you both and your budget. Step one is to cut out the excess. Most of us spend too much money on entertainment or shopping. If this is you, the next step is to revisit your budget and work on self-discipline so that you can stop spending money you don’t have on things that you may not actually need. When merging finances in a partnership, many couples opt for a joint bank account. It’s as easy as going to the bank together with your personal information and setting up the account. Where it gets tricky is when you have to decide how to communicate about spending money from that account. 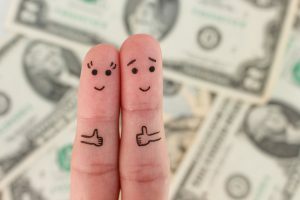 Some couples choose to retain their separate accounts and contribute a portion of their income to the communal account. Others will decide that it’s better to close their old accounts and commit to just the one joint account. It’s critical that you trust your partner and communicate with them to achieve a healthy financial life together. If you’ve opted into a joint bank account, you each have full legal rights to the money in the account. It also means that your account could be compromised if your partner gets into a lawsuit or fails to make payments to accounts held in their name like credit cards or utilities. For legal purposes, also keep in mind what the laws in your state outline about common law status and communal property laws. It’s important that, in addition to merging your finances, you have a plan in place in case something unfortunate should happen to you or your partner. Living wills, powers of attorney and estate plans are all part of protecting each other, should the worst happen. The best thing you and your partner can do to secure your future is save money and work toward your savings goals. Whether you’re saving up an emergency fund, planning your investments, or setting aside a retirement nest egg, having a robust savings plan will offer you both security and comfort. The unfortunate reality for many American couples is that they live paycheck to paycheck and have little to no savings whatsoever. Mounting debt payments and overdue medical bills can pile up creating an aggregate effect that makes it nearly impossible to get ahead. If you’re struggling to make your monthly payments, CreditGUARD can help. Our certified credit counselors can offer you nonprofit debt consolidation and debt management options as well as financial education that will help you work toward a better financial future. Call CreditGUARD today at If you’ve found yourself in a pinch, you may have considered a payday loan. If you’ve never gotten one, stay far away from payday lenders!